Figure. The atrophic skin on the patient’s lower leg and ankle. 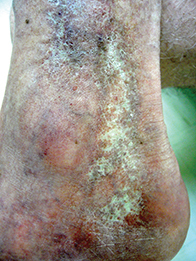 A 53-year-old nursing sister presents in winter with gradual onset of reticulated white skin on her lower legs and ankles (Figure). She recently developed a small but very painful ulcer in the affected area on one leg, which has remained unhealed for more than six weeks. The correct diagnosis is atrophie blanche: smooth-textured atrophic skin that is white to ivory in colour and overlies an area of fibrosis. Patients often have multiple irregularly-shaped areas of affected skin that can coalesce to a degree forming a reticular pattern, as in the case described above. The involved areas of skin are depressed, and in some patients there are small red marks that are indicative of enlarged capillaries. Atrophie blanche is usually bilateral and the affected area is often surrounded by telangiectasia and hyperpigmented skin. Commonly affected areas are the lower legs and particularly the ankles and dorsa of the feet. Patients are usually asymptomatic from the atrophic skin itself but can develop painful ulcers, particularly in cold weather when physiological vasoconstriction exacerbates the condition. They may report a past history of ulcers, especially venous ulcers. Atrophie blanche is a spot diagnosis. The condition can affect people of any age and gender, but it has a predilection for middle-aged women. Atrophie blanche is thought to result from microvascular (not macrovascular) ischaemia caused by occlusion by microthrombi, which is noted on biopsy. However, biopsy is not recommended because it can result in nonhealing ulceration. Atrophie blanche is nearly always associated with chronic venous insufficiency and varicose veins. There are less common associated conditions, such as disorders of coagulation (including antiphospholipid syndrome and chronic vasculitis) and autoimmune diseases (e.g. scleroderma, systemic lupus erythematosus). Patients presenting with atrophie blanche should be screened for these conditions, especially if the cause is not initially clear. Ulceration of the skin should be treated with occlusive dressings, infection control measures and rest. Topical glyceryl trinitrate applied to the surrounding area may be useful. The scarring of atrophie blanche is permanent. Once scarring has developed, the emphasis of management is prevention of ulceration. This includes measures to protect the vulnerable area from trauma and from cold exposure in winter, use of emollients to reduce fissuring of the surrounding dry skin, and management of venous stasis. 1. Milstone LM, Braverman IM, Lucky P, Fleckman P. Classification and therapy of atrophie blanche. Arch Dermatol 1983; 119: 963-969. 2. Sreedharan S, Sinha S. Atrophie blanche. Wound Pract Res 2011; 19: 74-80.